Our first destination is the world famous Molokini Crater, a marine reserve below water and bird sanctuary above. The visibility on this reef system averages 100+ feet. Molokini is one of the few places in the world where you can see Hawaiian garden eels, Masked angelfish, Long-nose hawk fish and many more fish endemic to the Hawaiian Islands. 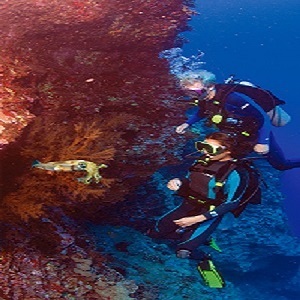 Our second dive is Turtle Town which offers a reef formed on lava that flowed from Haleakala centuries ago. The caverns and ledges in the lava as well as the lava fingers nearing the surface create the perfect habitat for sponges, corals, octopus, fish, eels, and shrimp. The highlight of this reef is the number of Green Sea Turtles that gather here to be "cleaned" by a fish known as the Hawaiian Cleaner Wrasse.